The Rapid 32kW Combi gas boiler is both central heating boiler and water heater wrapped into one. This means that no hot water cylinder is required helping to save you space in your home. This is particularly useful in smaller homes where space may be limited. 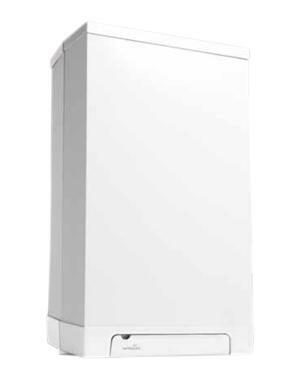 This highly reliable boiler is a condensing wall mounted unit which has been designed and manufactured by Intergas. The reliability of this boiler can be attributed to the wide range of features and benefits including an built in expansion vessel fixing bracket and no jig, mirrored sight glass, a built in digital time clock and a flow rate of up to 13..2 litres per minute. This boiler is easily accessible as the boiler case is removed from the front. It has just 12 components with only 4 moving parts which means there is less maintenance needed, a lower service cost and greater reliability. This boiler condenses 100% of the time which means it reuses heat and therefore energy that would otherwise be lost in wasted energy. This should help you to save you money on your bills in on both heating and hot water modes. The boiler has an efficiency rating of 88.9%. The output rating of 32kW makes it the unit perfect for medium sized homes that don't have an excessive need for hot water. It is available in 2 outputs and in either natural gas or LPG, so there will be a unit to suit your home. The boiler includes a 3 year warranty on parts and labour with a 7 year warranty on the heat exchanger.